John Kelly Snyder, beloved husband of Linda Hertell Snyder, died Friday, October 21, 2016 after years of declining health. No one would ever have known, however, as Johnny was a proud man who sucked it up, and refused to let others see the pain and distress he was in. 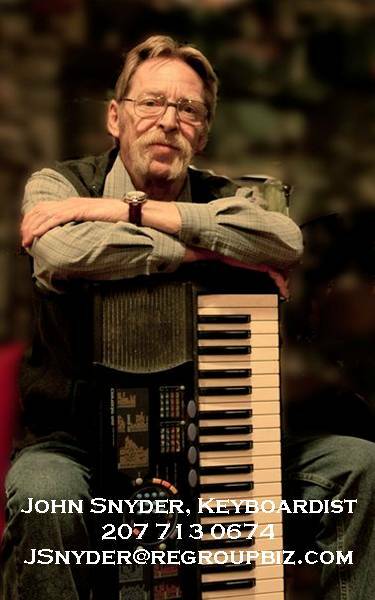 John was born on 20 September 1956 in Toledo, Ohio, the first son of Evelyn Mae (Smetana) Snyder and Eddie K Snyder. After Evelyn died of pneumonia when John wasn’t quite two and a half, John and his younger brother Andy lived with their maternal grandmother until their father remarried; the new family then moved to Andover, Maine where Eddie was in charge of the new Telstar Satellite Station. One of John’s favorite jobs was working at that station while still in high school; forty-something years later he gave a presentation to the Lewiston-Auburn Rotary Club on the topic – and it knocked that crowd’s socks off. After high school, John attended Daniel Webster College in Nashua NH earning his Associate’s degree. His studies included intensive training in flying helicopters; he wanted to work as a pilot, but he was graduating with his license just as our military guys were coming out of Vietnam with real life flying experience, so John never had the chance to fulfill that dream. In 1976, John married Nancy Melville of Locke Mills; together they had two children, Ried and Amber, and adopted another daughter, Barbara. John, Nancy and their children lived in an 1800s farmhouse on several acres in Hiram, ME. John loved his Hill Gully Farm, despite the inherent problems of an old New Englander, and raised all sorts of animals (including several dachshunds, his favorite breed of dog), and multiple household crops. He spoke proudly of the time and effort he would put into tending to his cornfield. While living in Hiram, John began work at Howell Labs in Bridgton, initially on the Shively side helping to install radio antennas throughout the U.S. (despite intensely disliking heights – and that’s saying it mildly). 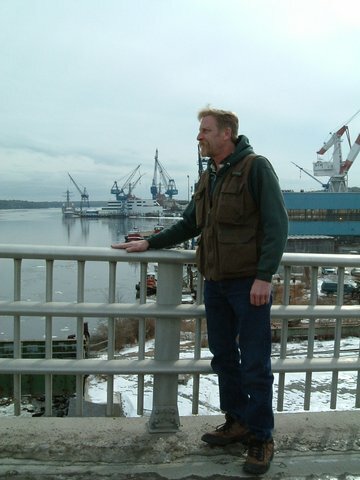 He later moved over to the Howell side, where he excelled in installing and servicing survival systems on Navy ships; by the time he left Howell in 2006, he had worked on 105 different ships all over the world. Such was John’s job that he would never know when he went into work in the morning if he’d have to prepare to drop everything and fly half way around the world, sometimes being gone from home for weeks on end. Except for the time spent in airports and hotel rooms, John loved that job. Not only did he install and service the equipment, but he spent countless hours teaching sailors how the systems worked; a natural teacher, John received many kudos from sailors and brass alike in his ability to get complicated topics across. John was one of those rare people who could give an entire lecture without a single “umm”, “er” or other awkward interjection. In 2006, John left Howell Labs to take the position of Facilities Director for Main Street Property Management, which at that time had contracts to manage approximately 50,000 square feet of office space spread across 10 counties, as well as several apartment buildings. In this position, John supervised a crew of 6-8 staff, developed systems to manage the company’s equipment (he quickly realized that a couple of lawn mowers had blown their engines because the crew hadn’t been changing the oil in recommended time frames, a costly problem for the company), implemented a priority system for job requests, and so forth. In 2008, John remarried. Linda Hertell had been his 7th grade “sweetheart” and she would not let him forget how it all took place way back then… He would just stand by and grin as Linda told the story over and over of how he had sent her a ring from a cracker jack box in the mail over the summer… and then “dumped her” the first day of eighth grade. The 19th of September had actually been chosen because it was International Talk Like a Pirate Day, and all who knew Johnny, knew he got a great kick out of pirates! The wedding was held at our home, with a pirate-themed reception following, with guests all dressed in pirate garb, and which even included a wedding cake shaped like a pirate ship! John was extremely curious and an avid reader, particularly of military history (he didn’t care for fiction; nearly everything he read was history or science). He would excitedly come running to read a passage to me from his current book… in fact, his pride in his extensive book collection (and his pleasure in realizing I owned even more books than he did), was a common theme in our relationship, and served as a foundation for the little used bookstore – Heritage Books & Maps – that John was just beginning to get off the ground when he died. Johnny never asked for anything. He was content to stay at home, hike the woods in back of the house, and watch oldies television while reading or researching whatever topic happened to grab his fancy. Only once do I remember him asking me for something – the day he called me at work asking if he could bring home a puppy that his beloved Mr Budro (a rescued wire-haired dachshund) had picked out of a litter. He knew I didn’t want to deal with a puppy in the house, but I couldn’t say No. Johnny never asked for anything, so if he wanted something… well, I just couldn’t – I wouldn’t – turn him down. So he brought little Rudi home – and Rudi promptly attached himself to me, becoming my dog. As it turned out, Rudi was kind of a knuckleheaded little pup, so Johnny wasn’t all that unhappy about the turn of events. John was a man of many stories and countless politically incorrect jokes. He could talk learnedly on nearly any topic, but when it came to his feelings, he held them very close to his chest. I was forever teasing him to “tell me something nice”. His response was always “I love you. I don’t know what else to say.” And it was enough, because I knew that he did indeed love me more than he was able to express. There’s so much more to tell about this amazing man. How he was an engineer and involved in designing electronics equipment decades ago… but had to be dragged kicking and screaming from a flip phone to a Blackberry to an iPhone. 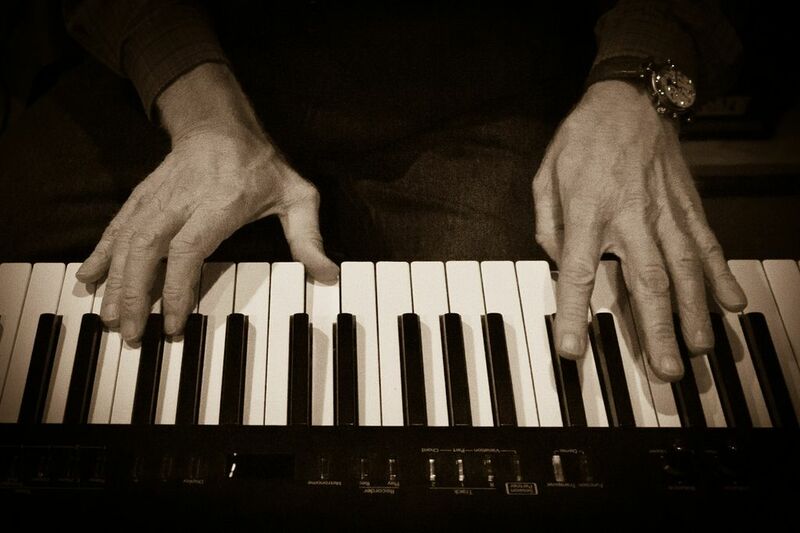 How he was a classically trained organist who could play a mean boogie woogie – and practically anything else he put his mind to, until his hands betrayed him and he could no longer make them touch the keys the way he ached to. How he loved Star Trek and NCIS. How he had made friends all over the world, and stayed in contact with them years after leaving his job as a subcontractor for the Navy. How one of his proudest moments was after helping sailors fix survival systems (via satellite relay) of the U S S Cole when it was bombed. He later met two of those sailors in Washington DC and they asked to shake his hand, thanking him for all of his hard work and dedication to getting them through that horrible time. How he was an inveterate practical joker, and how – according to an old friend – it was “amazing that he wasn’t killed by one of his victims”. Those jokes were “legendary” and “so complex they would require a short story to describe”. At the time of his death, John was the daytime Post Press Supervisor at the Sun Journal, and also co-owner with Linda of Heritage Collectibles, and Heritage Books & Maps. Although born in Ohio, John was more of a Mainer than many whose families have been here for generations. He knew the woods of Oxford County inside and out, and in 2004 was the 7th most prolific benchmark finder for the National Geodetic Survey team in the United States. Johnny installed a benchmark outside our home with the site’s latitude and longitude and inscribed with our names, and the words “The Great Adventure”. Johnny, I am so heartbroken that our adventure has ended. You will always be loved and missed. John leaves behind his wife, Linda of Auburn, and their 3 dogs, Mr Budro, Rudi and Millie; his children, Ried Snyder, his wife Kat and son Griffin of New Gloucester; Amber Snyder Bernard, her husband Mike, and son Lucien Kelly, and Mike’s two children Bella and Connor, all of Hiram; and Barbara Snyder, her significant other Joe Viscione, and daughters Myka and Temperance, of Salem, MA; and his step-daughter Jessamyn Hsu and her husband Joshua of Los Angeles. He also leaves his brothers Andy Snyder of South Paris, and Mark Snyder and wife Anna of Andover, and his ex-wife, Nancy Melville Snyder of Hiram. 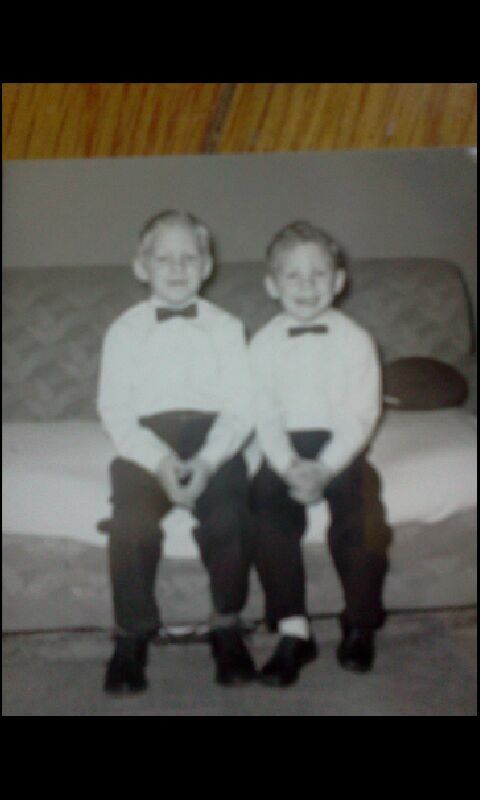 John was predeceased by his mother, Evelyn Smetana Snyder, and his father, Eddie K Snyder. 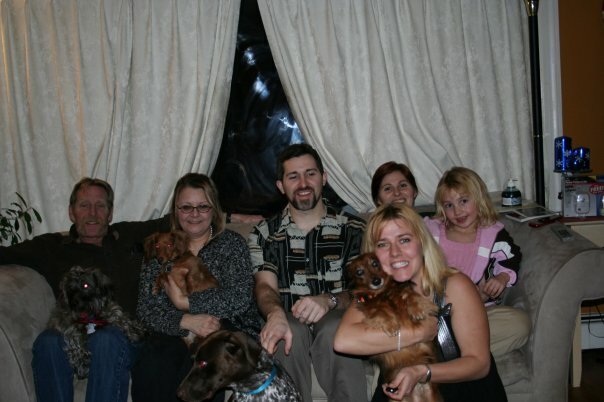 Other family members include his stepmother Katherine Snyder, a stepbrother Scott Snyder, and two half sisters, Cherie Ronayne and Lori Snyder, as well as many nieces, nephews, and cousins. As time goes on, I will add to this tribute to a man I will always love. If it might be meaningful to you or someone you care about, please watch for information on The Warrior Project (working title; this may change), a foundation I am beginning to develop for those who are fighting unseen battles. 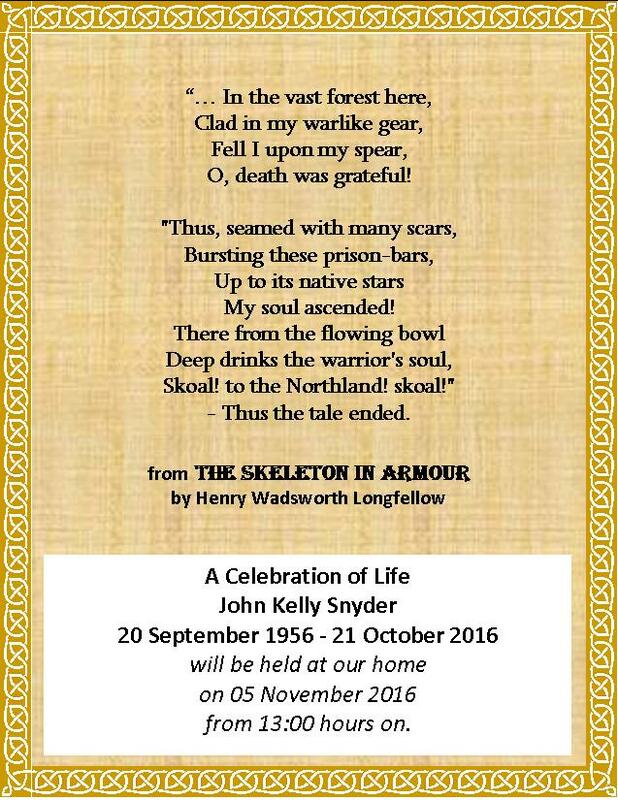 The Skeleton in Armour by Henry Wadsworth Longfellow. 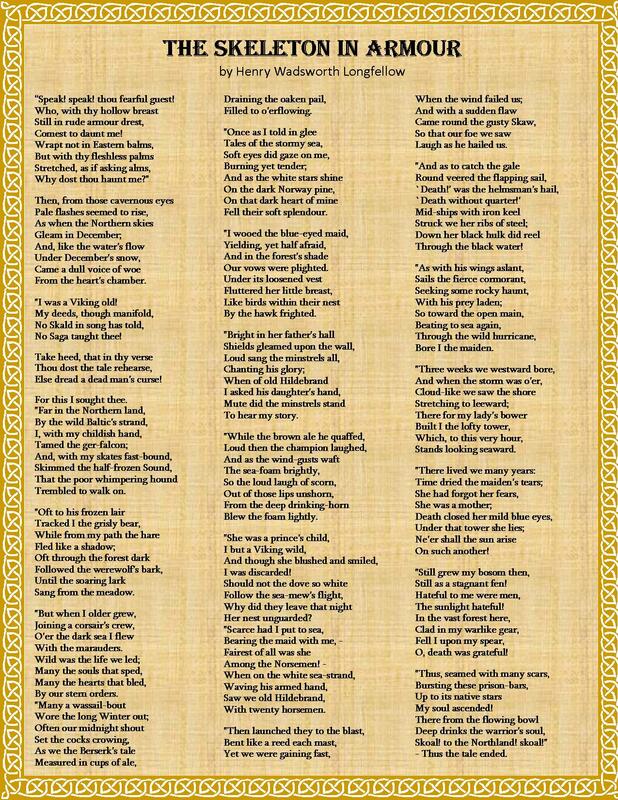 One of John’s favorite poems. 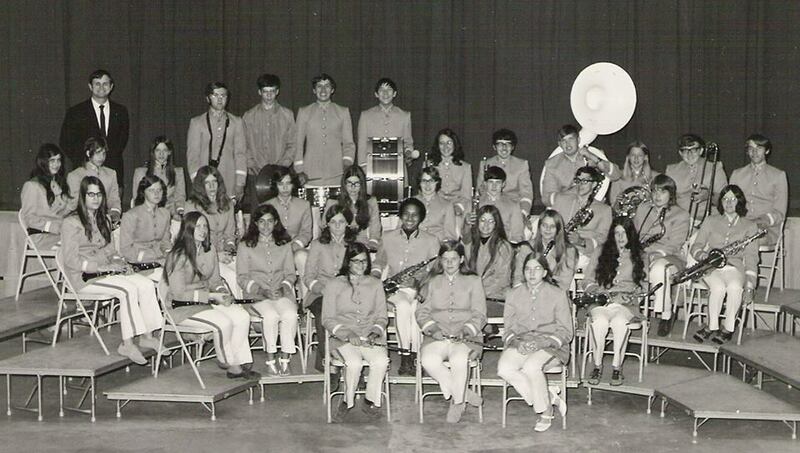 The Telstar High School Band. Both John and I were members. 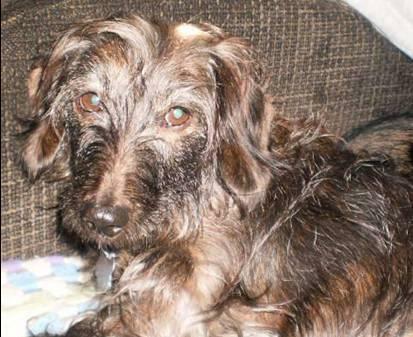 Buddy, aka Mr Budro, is John’s wirehaired dachshund. One of my favorite pictures. Johnny on a chilly day. 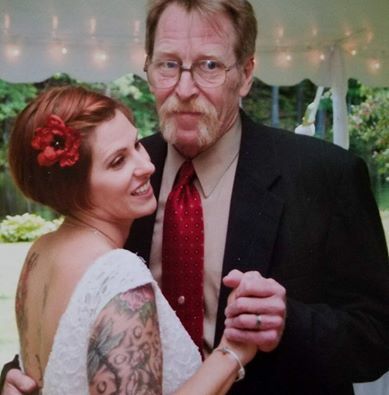 Father-Daughter Dance at Amber’s Wedding. 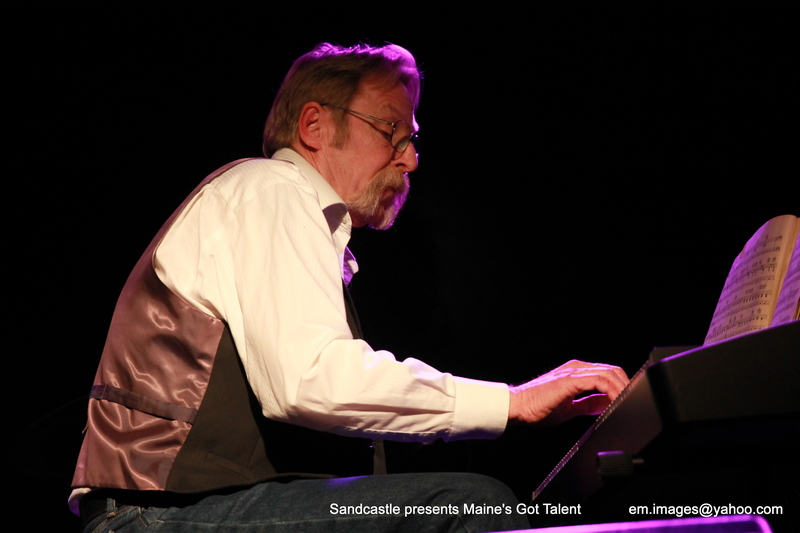 One of dozens of photos I have of John at the Maine’s Got Talent competition. Until his hands went bad, John was available to play for various events. Memories of Pa, from Ried Snyder. I’m not entirely sure what you’re seeking for the obituary, so some of this might sound like rambling. 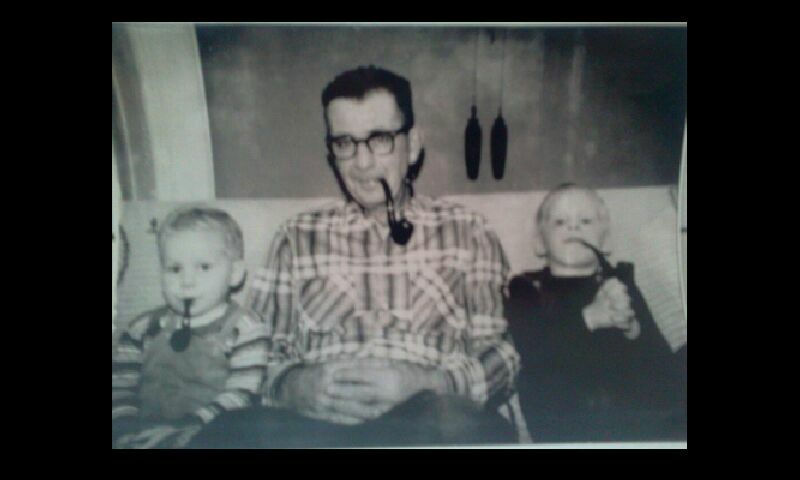 General memories, he was very fond of hiking, camping, and boating, and often went out of his ways to take us outside any chance he could, even on days when us kids weren’t all for it! We went to a lot of local places like Mt Cutler, Douglas Mountain, and camping down the Narrow Gauge. He did a lot of tree work around the house, mostly as a source of firewood in the winter. I ended up having to help with the majority of that, which involved cutting and limbing the trees, using the tractor to haul it all back to the house, where we then had to cut it down further and eventually stack it. It was pretty exhausting work and it was something we did through the week and not just on weekends. My favorite memory of that was there was one particular trail that we had blazed in order to get deeper into the woods to get at certain trees. Over the years the path became more developed and eventually, while I was still living at the house, I started to mow all the way up to it. It eventually overgrew with moss and ended up being one of my favorite walking trails, even if it wasn’t overly long. We did quite a few boat trips on Sebago, and a lot of them stuck out. One time it was a family trip but there was a storm that blew in and on the way back he was taking us really slowly back to the shore and I remember the waves were pretty high. It wasn’t until we were safely back in the car that he was pretty scared that we would capsize and that he definitely wouldn’t have taken us out if he’d known it’d get so bad. The other famous trip was him, mom, Damon and myself out on Sebago and pretty far from shore the motor died. We ended up taking turns having to actually row the boat to someone’s landing and dad got out to ask them if we could bring the vehicle around to pick us up. They were having some sort of get together and eventually relented but dad had to walk all the way back to the car (they wouldn’t drop him off) and the rest of us couldn’t get off the boat… it was pretty petty. He liked to play video games with me. Back when he has his old Texas Instrument we played this silly football game together, which I think was as much luck based as it was an actual football game. He played Nintendo games with me, usually switching off on single player games like “Dad” Galaxy in the Alien Asylum which was a very difficult sci-fi action/puzzle game. When the SNES came out, I think we did more together. By this time we played favorites like Super Mario Kart, where I really excelled; in order to level the playing field, we had to draft a set of rules which limited what I could do and I remember we kept it pasted on my bedroom door. Our other favorite was Pilotwings, which was a set of airplane oriented games. You had to do a series of different tasks in order to get your licenses, so we’d switch off during the tasks. He really liked the airplane flying parts, whereas I did parachuting and jetpack work! Before that of course we played a lot of board games, but I was younger and I mostly remember him beating the pants off me (and Am but I don’t think she played as many as I did) in most of them. Backgammon was a favorite of his. He also taught me how to play chess, where I think I’d be more his equal nowadays but we stopped playing most of them by the time I was a teenager. He was very handy around the house and he’d usually have me assist him. He also helped me with electronic work on my old Dodge Aries when the wiring for all the electronic windows started to die. Having said that, he was also very accident prone. One time when me and Am were young, he was showing us how to properly wash a knife in the sink, only to then slice his finger wide open! He also put an axe through his foot one day chopping wood. Somehow though, once we finally got his boot and sock off, we found out he’d put the blade perfectly between his toes and he ended up with just a little scratch. Also, Al Milewski, who was an old high school friend of ours, gave me his condolences the other day and then told me that dad was the reason he’d gotten into engineering, and that he’d given him one of his helicopter books to further inspire him. Dad was the reason I got into engineering too, although I went with chemical cause I liked chemistry better than physics. John’s practical jokes were legendary, but so complex that they would be short stories by the time they were written out. A manufacturer’s face to its customers is its Field Service representatives. Service Reps can make or break a firm’s reputation. John was a great Service Rep, able to relate to everyone involved, from the Captain to the lowliest sailor in the engineering spaces. He would always find time to hold “school call” with the sailors to teach them the hidden tricks to running the equipment. This made many friends for us. My memory, (what’s left of it!) is that John knew some of the people who were injured or killed during the attack on the USS Cole. He had met and trained them on the HLI equipment on the ship earlier. After the attack John returned to the Cole to assess the damage to our equipment. I believe the equipment was returned to the factory for refurbishment. Perhaps others remember more. I don’t remember if he returned to the ship after the equipment was re-installed. John and I shared a sometimes different sense of humor. An example is that Calvin and Hobbes was a favorite of ours. As Steve has stated before, John was very good at rubbing elbows with all sailors, and very good at school call for them on their ships’ HLI equipment. He not only had the respect of the guys in the HLI shop for his technical expertise, but they genuinely liked him as well. Perhaps you can tell that I genuinely liked and respected him as well.